1. Make sure you installed SQL Assistant in Admin mode. Do not confuse running programs in Admin mode with being logged in as a user with administrative account. By default latest versions of Windows ignore your administrative privileges and attempt to run all programs in low-privileged user mode. As a result, configuration changes made in the registry or configuration files are erased after program run or logoff. To run the setup in Admin mode, right-click on the setup program and choose Run as Administrator from the popup menu. Note that location and name of this command differ in different Windows versions. 3. If the above doesn't help, start SQL Server Management Studio in Administrator mode. Check if that resolves the problem. If yes, it means that the low-privileged account used to run SQL Server Management Studio is unable to see add-on settings in the registry and unable to load it. Another way to verify it is to close SQL Assistant running in the system tray and start SQL Server Management Studio. Open new code editor window. 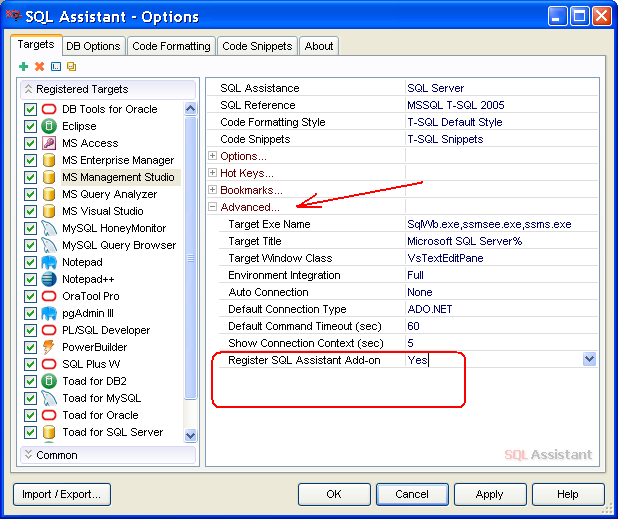 If the add-on is correctly installed, SQL Assistant menu should appear on top and in the right-click menu in the editor. Please note different versions of SQL Management Studio have different name of the main executable file. If you don't have ssms.exe try it with SqlWb.exe or ssmse.exe. You can check properties of SQL Management Studio shortcut in the Windows Programs menu to find out exact location and name of the executable file. When running this command you should get a message that SQL Management Studio cannot open file sa:traceloglevel:9 Please ignore that message. Open edit window and type word SELECT then type space character. Switch the database and type another SELECT then type space character. Please post the the log file created in C:\Documents and Settings\[Current User Name]\Application Data\SQL Assistant\4.7 folder. Here [Current User Name] is used as a placeholder for your user name. Please note that SQL Assistant's Connect to Database dialog should not appear when using SQL Assistant with SQL Management Studio. As long as you get that dialog, the connection is not shared. As a result, SQL Assistant is unable to see connection changes in SQL Management Studio and follow the database connection context in the editor. That indicates a security related issue. Some values saved in HKEY_LOCAL_SYSTEM hive of the registry appear erased by Windows or anti-virus after the install is done. Registry update/read methods in 4.7 use different update sequencing, which is more sensitive to such issues. You're right, that got it working! Also explains why 4.7 worked fine for all my coworkers who upgraded, but not for me with a clean install. Thank you for your message. Please reenter your message as a separate topic. It has nothing to do do with the subject of this message thread. I will reply to your new message. Not work for Microsoft SQL Server Management Studio 17. No plugin menu. Work only "Save documents" then close studio. Which SQL Assistant version are you running? Which SSMS version, full number? Thank you for the details. I'm going to enter a separate topic for SSMS 2017 build 14.0.17099.0.